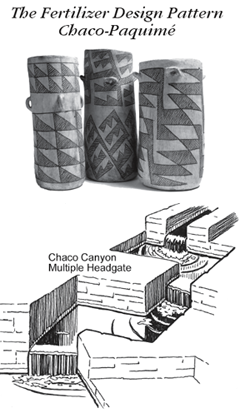 Chaco Canyon accentuated “stepfret” design - At Chaco Canyon the “stepfret” ceramic design is very dramatic and sharply pointed. I believe the black and white relief symbolizes a dualistic universe, male and female. I also suggest that the very sharply angular stepfret design used at Chaco is indicative of male lightning which they associated with fertile rainfall. At Chaco the stepfret was primarily lightning male and at other Anasazi locations represented the more female 90 degree angle step (above). underground sewer line, I propose, is evidence that it is the design associated with naturally occurring, as well as human produced, fertilizer (above). Charles DiPeso examines the obvious male/femaile relationship with the Macaw enclosure doorways. I propose this is the basic symbolism used for the dualistic nature that was revered by the Pre-Columbian Oasis America cultures. “Sky, clouds, lightning, precipitation and the wind - strong evidence that the associated beliefs concerned fertility and weather control. The icons thus provide evidence for the existence of an earth/fertility cult ... beliefs involving the well-being of the collective and the earth rather than the well-being of the individual and ancestors. ... This uniformity in design styles on a virtually pansouthwestern basis suggest that the design transcend whatever regional economic systems existed in the 1300s. 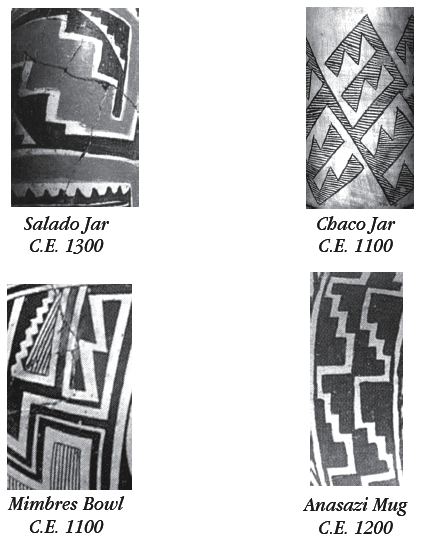 It further indicates that designs masked rather than emphasized any economic or political boundaries extant at this time.” Ceramics and Ideology by Patricia L. Crown, Ph.D.
Zuni symbolism indicates that “every design is significant ... , the tendency at Zuni to invariably associate decorative designs with ideas of a religious character. This is not a personal peculiarity of one woman, but is a general pattern of Zuni thought. 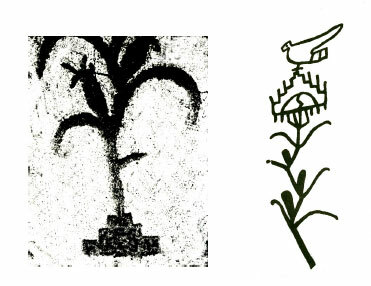 ... An overwhelming number of designs suggest clouds of different kinds, – rain, snow, wind, lightning, flowers ‘because they come out after the rain.’” The Pueblo Potter by Ruth L. Bunzel, Ph.D.
Stepfret and spiral designs throughout the Anasazi world and well beyond demonstrate similar religious belief systems. 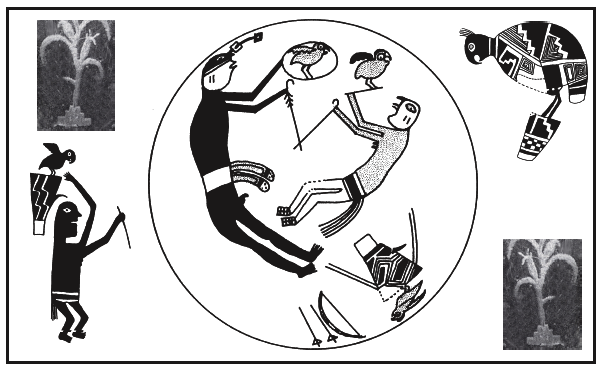 The designs can be seen as similar to the yin/yang concept of Oriental religions; the Tarahumara culture explains them as a male/female relationship. 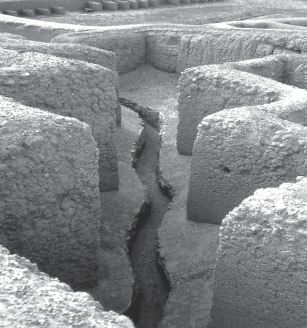 The Tarahumara religious and cultural concept of stepfret and spiral design patterns is in fact so simple as to be almost painful. Their belief system is that the universe and the earth are made up of two essential components-male and femalewhich fit together in an exactly matching cosmic unity. 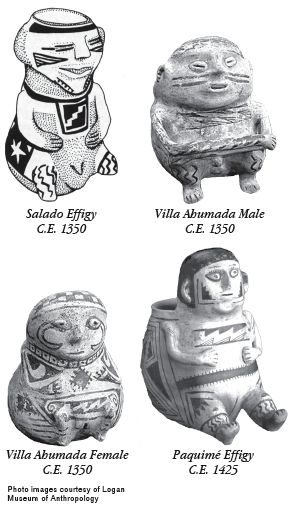 These designs demonstrate the weight of their significance throughout the Oasis America culture by the fact they were reproduced perhaps many millions of times on ceramics as well as in massive architecture as seen at Paquimé and perhaps Zuni. Along with Scarlet Macaws and many other common features, these designs can be seen to indicate a shared religious belief system throughout the region and throughout the 250-plus year time frame from Mesa Verde in the north to Paquimé in the south. Other theories proposed include: this design has no specific meaning; it is a simple cloud pattern; it originates from the basket weave designs of 400 years earlier. macaw on carrying basket and with the kokopelli macaw trader. Paquimé archaeologist (Charles DiPeso) is shown (right) with anthropomorphic male “plug” from the stone birth canal of the ceremonial macaw birthing chambers. 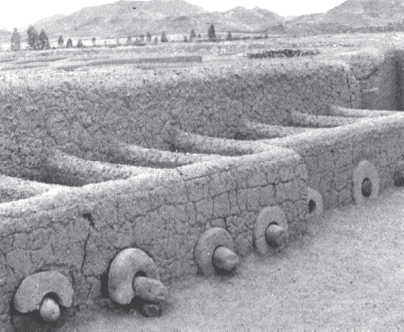 These enclosures have been previously interpreted as macaw nesting boxes. It is noted, however, that macaws are very unlikely to breed and nest under the conditions illustrated in the lower right photographs. The original interpretation given here is that the macaws exit mother earth during major religious ceremonies, most likely at the spring equinox. As they walk into the light they are lifted by the priest to greet the father sky. The “macaw stones” or doors to parrot pens show an isomorphic patterning with ballcourt distribution (Whalen and Minnis 1996). Our interpretation is that many of the architectural structures identified as “ballcourts” are actually fertilizer dehydration basins. The macaw stones were used as water control devices in this context and also have the religious connotation of releasing the fertile water, thereby completing the rainwater/fertility cycle for the corn crop. This is a completely new concept, and as far as is known, the actual layout and design of the fertilizer dehydration basin relating to the macaw stone cannot be understood without further study.